DriveThruRPG.com - Heroic Maps - Other/Generic | Virtual Tabletops - The Largest RPG Download Store! 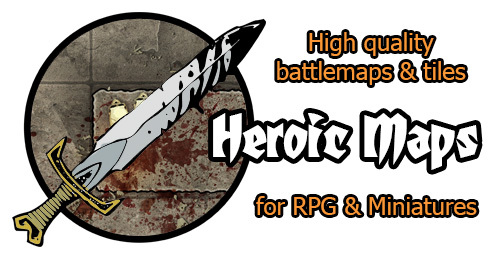 Heroic Maps produces high quality, full colour battlemaps and tiles for RPG games and miniatures. We strive to produce RPG maps with a high standard of artwork featuring a variety of locations; castles and villages, dungeons and crypts, temples and caverns. Storeys: Multiple levels - ground floors, top floors, cellars - take your adventure upstairs and down! Day & Night: Includes both daytime and night time versions of the map. Encounters: Battlemaps featuring specific locations, ideal for encounters. Small Tiles: 6 x 6 geomorphic tiles, available in both pdf and printed versions. Modular Kit: Rooms, corridors, chambers - build your own adventure map! Giant Maps: Huge maps of unique locations, perfect for VTT or poster printing. Ships: Deckplans of sailing ships for fantasy and historical nautical adventures. We'd love to hear what you think of our products, or if you have any questions or suggestions for future products you'd like to see, please get in touch.